I’m not a spinner, but this is a great idea! I’m not a spinner and the first thing I thought of was all these hats and scarves that I am making for my daughters and neices for their winter gifts (I say winter because they get them when the weather turns cold so they can stay warm). I think the idea is wonderful. I have a pattern that I am just about done with the test knitting portion. 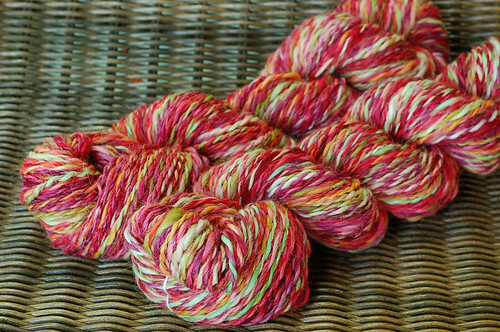 I did not spin the hand spun yarn myself though I bought it on etsy as I have not yet learned to hand spin my own yarn yet. Can I still submit the pattern? I would love to have the roving for learning how to spin which I plan to do soon. Hmmm. . . I might have to teach myself to spin just to win these prizes! How exciting! I can’t wait to see the results. I always wonder what to do with my handspun. Great idea… Just heard a Yarn School student asking what she could expect to make out of 4/8 oz. Did anything ever happen with this contest? I’d be interested in hearing about it. I had no time myself, though I wished I had. Right now I am using a lot of older handspun in varied lengths and thicknesses in a feather and fan with cables rectangular wrap. I still have a lot of 4 oz. amounts of fiber left to spin and I’ve been trying to find colors that might blend together, spinning them up and then plying together to make enough yarn for a project bigger than a hat or mittens.